There is a time and a place for a frank but thoughtful critique of a veteran filmmaker's love letter to genre cinema. There's also a time and a place to geek out, cast off adulthood, fully embrace the rock-em sock-em joy of a wildly entertaining and ludicrously action-packed summer spectacle, and laugh, clap and cheer like a ten-year-old fanboy attending his first Comic-Con; and it's here and now. Pacific Rim might just be the most fun you'll have with a movie all year... or a gigantic waste of time; depending on how willing you are to embrace it on its own terms. It's certainly one of the most unapologetically joyous genre-splosions in recent memory, and a film with aspirations as enormous as its scale. Make no mistake, though: director Guillermo del Toro hasn't crafted a film for everyone. Nor did he set out to. He's crafted yet another fearless passion project in a career bursting at the seams with 'em, and its one heck of a masterfully designed, visually enthralling crowd pleaser. Critics may balk at the ham-fisted dialogue. And yes, it's there. Cinephiles may bemoan the cast's performances and the film's comic book sensibilities. There's not much of a defense to mount. A few wayward del Toro fans may even shrug their shoulders altogether. It's all at once fully del Toro and unlike anything the Hellboy-helmer has done before. But for those whose eyes widen during every Kaiju attack, for those who grin uncontrollably with every Jaeger battle, for those who marvel at the film's sprawling cityscapes, dazzling destruction and massive bot-bunkers, and, more importantly, for all those faithful fans willing to let go and let del Toro, Pacific Rim will be something else entirely: an absolute blast. August, 2013. Rising from the depths of the Pacific, the first of what will become known as Kaiju -- vicious behemoths that spill through a dimensional rift at the bottom of the ocean -- reaches land and attacks San Francisco. The destruction is unparalleled, tens of thousands of lives are lost, and the eventual military victory against the beast is a costly battle that drags on for days. November, 2014. In response to three additional attacks, the superpowers of the world come together and develop Jaegers; towering, heavily armed mechs operated by a pair of innately skilled and specially trained pilots whose minds are linked through a process known as The Drift. For several years, the Jaegers are successful, patrolling and protecting coastlines, killing any and every Kaiju that emerges through the portal. The world celebrates, the Jaeger pilots become celebrities, the once fearsome Kaiju are reduced to variety show caricatures and late night show jokes. It seems the crisis has been averted. February, 2020. 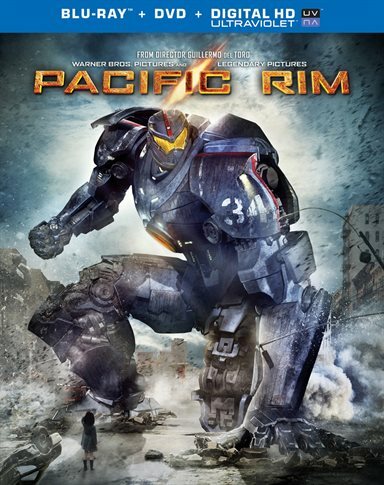 American Jaeger Gipsy Danger, piloted by brothers Yancy (Diego Klattenhoff) and Raleigh Becket (Charlie Hunnam), is torn to pieces by a particularly fearsome Kaiju. It seems the creatures are becoming more powerful with each passing month. Yancy is killed in the battle; Raleigh barely survives, piloting the tattered remains of Gipsy Danger to land before collapsing from the mental and physical strain. 2024. After becoming increasingly ineffective against the Kaiju threat, the Jaeger program is decommissioned. The UN will only fund the program for eight additional months, choosing instead to rely on defensive walls constructed near major cities. Commander Stacker Pentecost (Idris Elba) moves the remaining active Jaegers -- just four in all: Australia's Striker Eureka, China's Crimson Typhoon, Russia's Cherno Alpha, and a refurbished Gipsy Danger -- to Hong Kong, where he convinces Raleigh to return to service and team up with a new partner. Raleigh, though, is convinced that his new co-pilot should be young, inexperienced Mako Mori (Rinko Kikuchi), much to Pentecost's irritation and objection. But with multiple Kaiju breaching the rift, and scientists Dr. Newton Geiszler (Charlie Day) and Dr. Hermann Gottlieb (Burn Gorman) insisting more are soon to follow, Pentecost may not have the luxury of keeping Mako out of the pilot's rig. And that's just the first act of Pacific Rim. Del Toro crams more movie into two short hours than most tent pole trilogies offer in three installments. Yet the film never feels rushed or hurried, even when the director indulges in 25-minute battle scenes that stretch from one end of Hong Kong to the next. The sheer inventiveness and devil-may-care abandon of the Jaeger showdowns are the centerpiece of an already thrilling array of action-packed upbeats and beatdowns, and the mech and creature designs ooze inexhaustible detail and terrific design. I've seen the film twice now and pored through two discs of HD special features. I'm still noticing new things about the combatants' neo-steampunk construction and battle-ready alien anatomy. And not subtleties either. If nothing else, del Toro brings the very same craftiness and craftsmanship to Pacific Rim that have elevated his more memorable films to unforgettable heights, and in many ways, his bots vs. beasties opening volley offers the artist-turned-visionary a bigger, badder playground on which to let loose his imagination than ever before. Yes, the human element suffers on occasion. Raleigh is a rather two-dimensional hero (especially compared to Mako), the immovable Pentecost changes his mind on a dime, Raleigh's hot-headed Australian rival (Robert Kazinsky) is a genre trope in and of himself, and the dialogue, as mentioned, is a bit cringe-worthy at times. And yes, a few plot points could have used another round of rewrites and refinements, ranging from the more distracting -- How are coastal walls, the catalyst for the decommissioning of the Jaeger program, in any way more of a viable, less costly option than warrior mechs? -- to the trivial -- Why is Gipsy Danger's sword a last resort weapon? That's the first giant red button I'd punch at the beginning of a Kaiju fight. However, critical finger-wagging and script scrutiny just doesn't suit del Toro's comic book/manga/anime/feature film hybrid. Pacific Rim is, first and foremost, an eye-popping, popcorn-fueled, endorphin-pumping extravaganza. It's laugh-out-loud funny one minute (courtesy of Charlie Day and Ron Perlman, the latter as scene-stealing black market dealer Hannibal Chau), deliriously action-oriented the next (on an audacious and convincing mass scale no less), and wears its dramatic heart on its sleeve moments later. Unlike the usual summer actioner, Pacific Rim isn't ordinary, run of the mill Big Dumb Fun. It's Big Dumb Fun to the Nth degree -- let's call it Monstrously Entertaining Escapism -- and I'm already itching for a sequel that may never come. Here's hoping the film's overseas success persuades Warner to commit to a second clash of the interdimensional titans. Pacific Rim cuts a swath of stunning destruction in high definition with a 1080p/AVC-encoded beast of a transfer that's about as impressive as they come. Colors erupt on screen and pierce the looming darkness in dazzling displays of primary-gushing brilliance. Skintones are warm and lifelike, even when the palette pushes in more stylized directions. Black levels are as rich as the comic book and manga ink work they're meant to evoke, with heavy shadows, impenetrable storms and fittingly murky sea floors. Think Pacific Rim looks good? Wait'll you get a load of Warner's DTS-HD Master Audio 7.1 and 5.1 surround tracks, a two-headed beast of a lossless monster hell-bent on your home theater's complete and total subjugation. Battles roar, gears groan, Kaiju screech, rending metal screams, and explosions rock every battle scene, while a bustling, overcrowded Hong Kong cityscape attempts to survive beneath the combatants' feet. Audio Commentary (Disc 1): If you've never experienced the depth, detail and honesty of a Guillermo del Toro commentary, you're in for a real treat. Del Toro begins by touching on the enthusiasm and love that allowed his team to bring the film to the screen, then quickly moves to the production, the development of the project, the script's story and characters, the texture and rules of the Pacific Rim world, del Toro's mech and creature design, his approach to visual storytelling, and everything from practical and CG effects to the film's sprawling sets, performances and inspirations. The Director's Notebook (Disc 2): An interactive presentation of del Toro's Pacific Rim notebook. Clickable pages access interview pods, image scans and notes created during the film's pre-production. Also featured is a Magnify Mode that translates the director's Spanish text and activates exclusive galleries. The interface is a bit cumbersome and overdone, but the six video featurettes contained within are well worth watching. If nothing else, scan through the pages for the corresponding video icons and enjoy the additional Focus Points. The Digital Artistry of Pacific Rim (Disc 2): From the mind of the director to ILM's computer-generated Jaegers, Kaiju and devastated cityscapes, track the creative process behind the film's visual effects. The best bits involve behind the scenes footage of del Toro explaining his vision to the FX crew. The Shatterdome (Disc 2): Welcome to the Shatterdome, an archive of the film's key design art. Video and still galleries offer a streamlined, manageable presentation of the assets created during the three phases of production. Video pods include exclusive looks at never before seen animatics, maquettes and concept art. Deleted Scenes (Disc 2): Four decent but brief deleted and extended scenes are available: "The Wall of Life/Rations," "Excuse Me," "Theft" and "Catch You in the Drift, Dad." Drift Space (Disc 2, HD): A breakdown of the film's four Drift sequences. Blooper Reel (Disc 2, HD): Outtakes, mainly by way of Charlie Day and Ron Perlman. American audiences may not have rushed out to see Pacific Rim in theaters, but I suspect it will enjoy a long, happy life on Blu-ray and develop a much larger following. While tent pole filmmakers are forever attempting to make their particular summer blockbusters bigger than the last, Guillermo del Toro throws down the gauntlet, delivering a thoroughly entertaining genre pic that boasts off-the-charts size, scale and spectacle. Is the dumb in the film's Big Dumb Fun a bit much? Sure, but that's part of its charm. Pacific Rim is a blast from start to finish; a blast Warner's Blu-ray release makes that much more literal with a stunning video presentation and thunderous DTS-HD Master Audio 7.1 surround track. The 3-disc set is also armed with more than four hours of extensive special features, including a director's commentary, more than a dozen excellent Focus Point featurettes, and an entire second Blu-ray disc of additional high definition bonus content. Pacific Rim may not be the best film of the year, but its Blu-ray release is in serious contention for "Best of 2013" honors. Download Pacific Rim from the iTunes Store in Digial HD. For more information about Pacific Rim visit the FlickDirect Movie Database.